(Bd), is the most devastating vertebrate disease on record. Bd is found on all continents except Antarctica and the most dramatic declines of amphibians have occurred in Central and South America, Australia and the west coast of North America. Reservoir hosts are species which may transmit the disease to another species, without exhibiting symptoms or suffering from the disease. In Australia scores of amphibian species have declined due to Bd and many populations have dramatically fallen. The common froglet, Crinia signifera, is a common species which occurs throughout south-eastern Australia and it co-exists alongside many declining species which are susceptible to Bd. It reproduces in the same breeding ponds and occupies shared terrestrial habitats, and is therefore potentially capable of transmitting diseases to other species. Branelly et al. (2018) tested the potential for C. signifera to transmit Bd to other species of frog. Of the 526 individual C. signifera frogs studied, 79% tested positive for Bd, but showed no signs of infection. These results indicate that C. signifera is an effective reservoir host for Bd and may keep levels of Bd high at sites where threatened species have declined. It may therefore promote the spread of the disease among other more susceptible species. The findings of this study are important as they demonstrate that when developing conservation actions and reintroduction efforts, it is important to consider the ecology of the whole amphibian community so that the risk of disease reservoirs can be reduced (Branelly et al., 2018). The impact of pesticides on amphibians in their terrestrial habitats are poorly understood (Fryday et al., 2012). 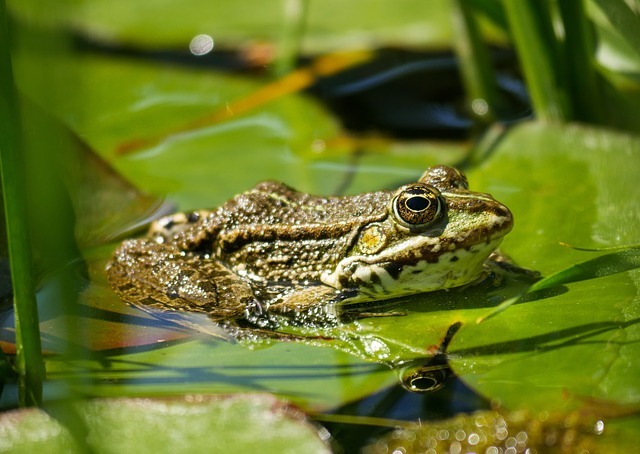 Although many laboratory studies have demonstrated that pesticides can have negative effects on amphibians in aquatic habitats, few have examined the impacts of chemicals when amphibians are on land. Pesticides occur frequently in amphibian terrestrial habitats and accumulate in their tissues. Amphibians are at particular risk to pesticides and other agricultural chemicals compared to birds or mammals since they have semi-permeable skin which can absorb toxic substances. Studies in recent years have demonstrated that amphibians often migrate across terrestrial habitats when agricultural chemical applications are at their highest in the spring (Berger et al., 2013). However, the exact levels of exposure to amphibians and the relative risks remain unknown. Swanson et al. (2018) carried out a study to try and obtain further information on the risks posed to amphibians in terrestrial habitats. 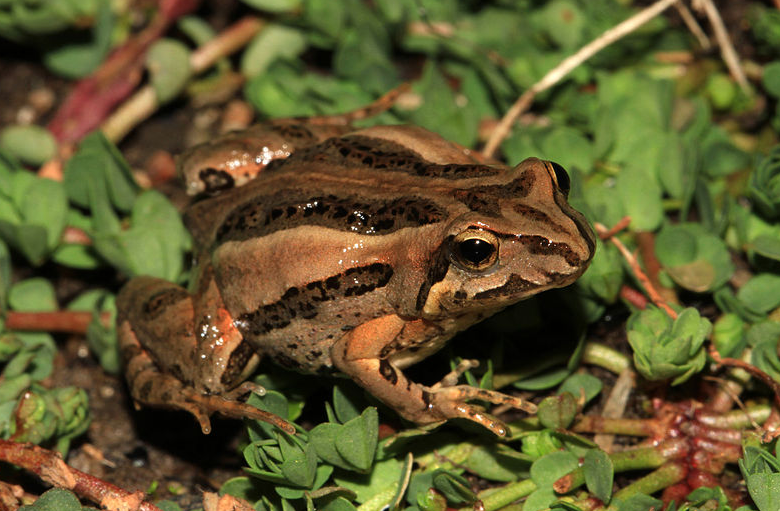 They carried out a field study on the northern leopard frog (Lithobates pipiens) of North America using a unique method involving a silicone Passive Sampling Device (PSD) to determine whether pesticides occurred close to individual animals living in different habitats. They also used radio tracking devices to assess the survival and determine the amount of time that individual frogs spent in particular habitats. Swanson et al. (2018) found that pesticide concentrations were highest in frog tissues in May compared to August, which corresponds to highest amphibian movement and pesticide use. They also found agricultural chemicals in amphibian habitats at sub-lethal concentrations including herbicides (atrazine and metalochlor), the organophosphate insecticide, chlopyrifos, and several fungicides. Although these chemicals were not at lethal levels, sub-lethal effects may be equally detrimental to the frogs. For example, atrazine can disrupt hormonal responses in frogs, reduce immune responses and alter their behaviour. Metolachlor slows development and growth and has negative effects on the thymus gland and when it co-occurs with atrazine, the effects are considerably worsened. Chlorpyrifos causes increased time to metamorphosis while exposure to fungicide formulations containing pyraclostrobin decreases growth and development in larval amphibians (see references in Swanson et al. 2018). Frogs in this present study spent 58% of their time in grasslands which had the lowest agricultural chemical concentration, however, frogs did spend a small amount of time in agricultural fields. The results of this study highlight the potential and risk of exposure of amphibians whilst migrating to breeding ponds in the spring and during occupancy of terrestrial habitats. Effective conservation and management of habitats for the great crested newt requires an understanding of the factors that influence its distribution and abundance. Most research on this species has been carried out in Europe and England, where populations are highest. Less is known of the factors affecting great crested newt populations in Scotland. This species is uncommon in Scotland and has a restricted distribution. Harper et al. (2019) examined the habitat and survey criteria for the great crested newt in Scotland using a large translocated great crested newt population. The results from this study indicate that great crested newts in Scotland may have different habitat and survey requirements to other populations in the UK and further afield in Europe. Specifically, the Habitat Suitability Index (HSI) may not always be appropriate for Scottish great crested newts. The researchers found no significant relationship between the HSI and great crested newt adult counts (peak or average). In addition, high HSI scores did not always correspond to high adult counts, with some low-scoring ponds containing more great crested newts (Harper et al. 2018). Harper et al. (2019) also found that by April, air temperature was a poor indicator for great crested newt activity with newts being equally active on mild and cold nights. The authors suggest this may be because great crested newts are better adapted to the colder weather conditions in Scotland and that the minimum 5°C night temperatures as advised by Natural England are too stringent for this species in Scotland. In addition, Harper et al. (2019) observed higher great crested newt adult counts on nights with moonlight, which were often cooler and found that great crested newt activity was higher on nights when the waxing gibbous or full moon was visible. The researchers suggest that moon visibility and phase should be incorporated into great crested newt monitoring and further research carried out to improve our understanding of lunar-related behaviours. Environmental DNA (eDNA) analysis is a tool for rapidly and effectively detecting the presence of a specific species using the DNA left behind in the environment. Metabarcoding is a more recent technique which can detect multiple species. However, the effectiveness of this approach remains to be tested. Harper et al. 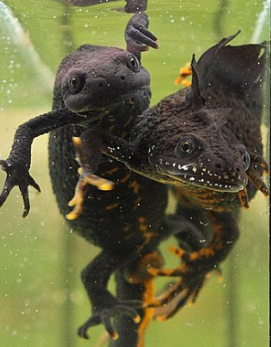 (2018) carried out a large scale study of 532 ponds to determine whether metabarcoding is as effective at detecting targeted species, such as the great crested newt, compared to eDNA techniques. Results from their study indicate that eDNA metabarcoding could potentially be a promising method for detecting many species in an ecosystem within freshwater ponds. However, at present, the method is less sensitive than standard single species eDNA methods for great crested newts and improvements are required to raise metabarcoding to the same level of detection as conventional methods (Harper et al., 2018). Berger, G., Graef, F. & Pfeffer, H. (2013) Glyphosate applications on arable fields considerably coincides with migrating amphibians. Nature Scientific Reports, 3: 2622. doi:10.1038/srep02622. Brannelly, L.A., Webb, R.J., Hunter, D.A., Clemann, N., Howard, K., Skerratt, L.F. & Berger, L. (2018) Non-declining amphibians can be important reservoir hosts for amphibian chytrid fungus. Animal Conservation, 21: 91–101. doi:10.1111/acv.12380. Fryday S.F. & Thompson, H. (2012) Toxicity of pesticides to aquatic and terrestrial life stages of amphibians and occurrence, habitat use and exposure of amphibian species in agricultural environments. EFSA external scientific report 2012: EN-343. Harper, L.R., Handley, L.L., Hahn, C., Boonham, N., Rees, H.C., Gough, K.C., Lewis, E., Adams, I.P., Brotherton, P., Phillips, S.& Hanfling, B. (2018) Needle in a haystack? A comparison of eDNA metabarcoding and targeted qPCR for detection of the great crested newt (Triturus cristatus). Ecology and Evolution, 8: 6330–6341. doi:10.1002/ece3.4013. Harper, L.R., Downie, R., McNeill, D.C. (2019) Assessment of habitat and survey criteria for the great crested newt (Triturus cristatus) in Scotland: a case study on a translocated population. Hydrobiologia, 828: 57–71. doi:10.1007/s10750-018-3796-4. Swanson, J.E., Muths, E., Pierce, C.L. Dinsmore, S.J., Vandever, M.W., Hladik, M.L., Smalling, K.L. (2018) Exploring the amphibian exposome in an agricultural landscape using telemetry and passive sampling. Nature Scientific Reports, 8: 0045. doi:10.1038/s41598-018-28132-3. First posted on www.froglife.org on 31 January 2019.